1. Which insurances do the physicians participate with? Most of our physicians accept Blue Cross and Blue Shield of RI, United Health Care, Blue Chip, Tufts, Aetna, Neighborhood Health, and Medicare. Certain physicians do accept other insurances as well. If your insurance requires that you obtain a referral from your primary care physician in order to see a specialist, please contact them before making an appointment with our physicians. 2. Do the various orthopedic surgeons specialize in different problems? Yes. Within the practice our physicians specialize in sports medicine, spine, trauma, hand, shoulder, elbow, foot and ankle, pediatric orthopedics, occupational medicine, oncology, and reconstructive and replacement surgeries. 3. Where are your offices located? 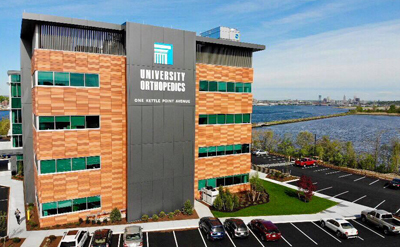 University Orthopedics, Inc. has offices located throughout Rhode Island. Click here to view our locations. 4. Do you have x-ray and therapy facilities within the office? 5. Do you see patients with work related injuries? Yes. The process of reporting a work injury and seeking treatment usually involves the injured worker filing a claim with their employer, then either the injured worker or the insurer sets up the medical evaluation. There are less common situations where there is an established relationship between the employer and the health care provider to see their injured workers. 6. What hospitals are University Orthopedics affiliated with? Rhode Island Hospital, Hasbro Children's Hospital, Miriam Hospital, Pawtucket Memorial Hospital, and Newport Hospital. 7. Can I see one of your physicians if I do not have an insurance that you participate with? Yes. Patients can pay for our services at the time of the visit and submit bills to their insurance companies for reimbursement.